Ascaso 2CSdb I-2 is another grinder from Ascaso grinder which has a specialty that it has infinite amount of step adjustments. It is built very quality with aluminum exterior and is quite durable. 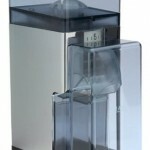 Its design is very eye appealing so it is likely that it will fit well in the kitchen. The grind is consistent and recommended for grinding espresso shots. Its price which fluctuates around 280$ is also not too high for the quality that you receive. It comes with spacious bean hopper, which can hold up to 1.3 pounds of coffee beans. The Ascaso 2CSdb I-2 grinder is equipped with 54mm conical burrs that offer long term durability and can be used for a wide of coffee bean types and sizes. Ascaso has developed two versions of their coffee and espresso grinder one with a flat grinding wheel system and one with a conical cone shaped grinding wheel. The flat wheel grinder is called the I-1 Grinder and the conical grinding wheel version is called the I-2 Grinder (this is the I-2). The grind is consistent, but the grinder has similar problems as its mini version. Some coffee grounds tend to get stuck in the chute. It is however not too hard to clean those grounds, just a bit inconvenient. The hopper is made of rigid plastic and holds approximately 1.3 pounds (600 grams) of coffee beans. This is significantly more than Ascaso i-Mini. This amount is enough to make 60 shots of espresso. The hopper just lifts off for washing, and the top of the grinder is easily removed to allow access to the burrs for cleaning. The ground coffee is dispensed directly into your porta filter handle from the chute – so it does not have grounds bean, although some models do have a doser; at those who do not you can buy one extra. You can dispense the coffee into a small cup or container. The functions are the same as of the Ascaso i-Mini grinder. A knob of the side of the grinder can be turned on a continuous scale, provide an infinite grind size between the finest and coarsest size limits. Turn the knob on the side of the grinder to adjust the grind finer, or turn it the opposite direction to make the grind coarser. Ascaso refers to this as Micrometric Regulation System (MRS). The adjustment knob allows for infinite grind settings. To activate the grinder, you simply hold the porta filter handle against the button on the front of the grinder to activate the grinding mechanism. Note that grinders with the above stepless adjustment are not good candidates for grinding for multiple types of coffee brewing methods. The reason is that it is difficult to change settings from very course for French press to very fine for espresso as turning the adjustment knob countless times makes this impractical. However, to fine tune a grind for espresso, the stepless feature works great! So infinite amount of grind settings is good unless you are brewing at very different methods all the time. It is an ideal grinder for someone who wants to fine tune the grind size of their coffee to meet their flavor preferences (especially for espresso), but it would be a good idea if they included reference marks on the stepless knob to help you recall the grind settings from each use. One important and often overlooked task required of owning a good coffee grinder is routine cleaning. 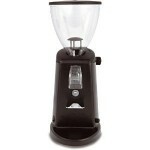 To clean, just remove the coffee bean hopper and cover to expose the grinding chamber. This takes about 30 seconds. You can perform a thorough cleaning to remove built up coffee grounds around the main cutting wheel and then reassemble the grinder – total time is about 2 minutes. There are not many Amazon customers who would have commented on the product. However on the internet many other people have written reviews which are in general positive about the product. The comments are fairly similar than those for Ascaso i-Mini. People like the infinite amount of step adjustments, design and consistent grinding. They do not like the loudness and the fact that there are a lot of grinds left in the chute. The price of Ascaso 2CSdb I-2 is around 250-300$ on Amazon. 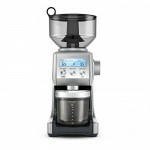 If you have a home espresso machine with a commercial group, this is one of the less expensive grinders that will give you an optimum grind. Also, since home machines require time to warm up and recycle between shots; it’s slow performance will not create extra delays. 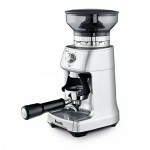 This is also a great grinder mainly for making espresso. Also stepless grind settings might be a valuable feature.